Germfree manufactures complete modular facilities to provide flexible cGMP-compliant production space and R&D laboratories. Our bioGO™ Fast-track Adaptive Modules incorporate aseptic process areas as well as containment for potent APIs. They are engineered to handle your current requirements and can be reconfigured for future process change-outs. bioGO BioPharma Modules are self-contained allowing them to be installed wherever they are needed and without complex on-site infrastructure. We also manufacture turnkey biocontainment labs up to BSL-3 and ABSL-3. Germfree’s bioGO BioPharma Modules are manufactured in our controlled factory environment, to deliver an advanced solution in an accelerated timeline. 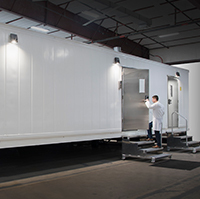 Germfree designs and manufactures complete BioPharma modular facilities to provide fast and flexible cGMP-compliant production space. Our bioGO Modules incorporate cleanroom process areas as well as any needed containment. They are self-contained and suitable for installation into an existing building or as a freestanding facility. bioGO BioPharma Modules provide an optimal platform when dedicated space is needed for preclinical drug development or small-batch production. Our facilities are reconfigurable and can be repurposed to accommodate the next project in the pipeline. Germfree bioGO™ Modular laboratories that provide an ideal option for a wide range of biopharmaceutical applications that require biocontainment. bioGO turnkey facilities provide new capabilities anywhere they are needed with biological safety levels up to BSL-3 and ABSL-3. 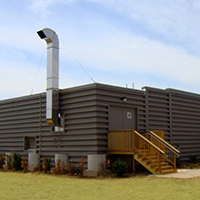 Biopharma Lab Modules are utilized for any application carried out in a conventional building. They meet or exceed the functional and structural quality of brick and mortar projects. Our integrated equipment, interior finishes and casework are engineered for both cGMP-compliance and biological safety standards.